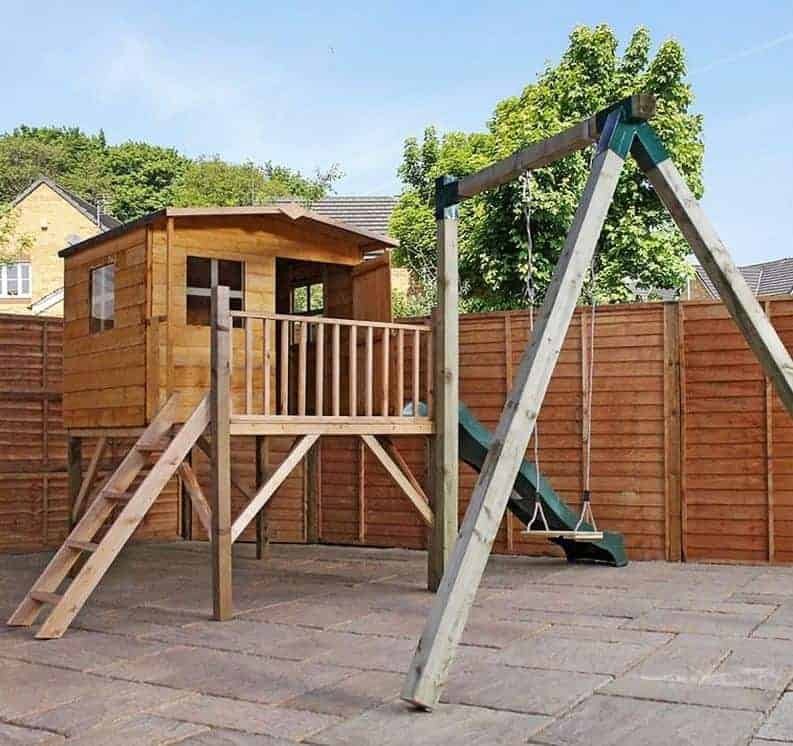 The 13 X 12 Windsor Rose Tower Activity Centre Playhouse is the perfect way for you to turn you garden into a playground and give your children or grandchildren a really fun place to play. There is just so much going on here that the kids are not going to know what to do first. The actual playhouse is a very good size and offers them plenty of room to play with their toys or even with a few friends. The tower nature of the playhouse means there is a great decking area that has a ladder and a slide connected to it. Perhaps the most fun of all though is the swing that is attached to the playhouse. While the swing, ladder, slide and the playhouse are all fun, this is actually one very well made set. The playhouse is made with 12 mm thick tongue and groove cladding and then supported with a thick frame to ensure the whole structure is very strong, secure and safe. Impressively strong flooring is used so they can dance, jump and in general just have a really fun time. The apex roof will keep the rain away and there is a very attractive overhang that will provide a little shade on the decking area. 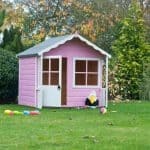 The 13 X 12 Windsor Rose Tower Activity Centre Playhouse is the ideal playhouse for those of you who want an all in one activity centre for your kids. This playhouse has all that you could possibly want. Before we get to the cool extras though let’s take a closer look at the actual structure. You will need quite a bit of space to install this as the width is 13 feet 2 inches and the depth is 12 feet 2 inches, so this is quite the impressive specimen. As this is a tower playhouse its stands at over 7 feet high. 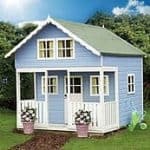 So while this is one very impressive looking playhouse, we cannot stress enough how important it is to check that you can fit it into your garden. Ok so let’s now take a look at the main features of this playhouse. Of course the actual playhouse is fun and there is a really smart decking area just outside of it. Now this decking area can be reached with the ladder and then there is a super fun slide on the other side. 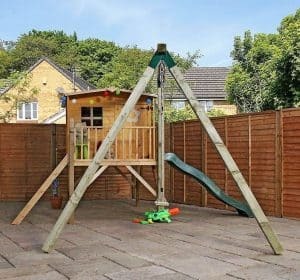 Although when you come to install this in your own garden, we would recommend you do not place the slide right next to a fence like the one pictured. Now this alone is great, but this playhouse takes things a step further as there is an extra section that has a swing on it. It is like the kids have their own little playground in their own garden and we do not think there is a kid in the country who would not love this. The apex roof is very interesting as it has quite a shallow angle which we must say, we really like the look of. There is an overhang that goes over the decking area and this we feel is a very nice touch. The roof is made with solid sheet boarding which is 8 mm thick and then covered with some strong roofing felt. Honestly the roof is fine for a playhouse and we have no complaints about it at all. The tongue and groove shiplap cladding as you can see is very easy on the eyes, but it is also very thick. The cladding is an impressive 12 mm thick which will be able to take the odd hit with a football, the kids running into it and anything else they put the poor playhouse through. We really like this cladding as it offers immense protection from the rain, is strong and of course it looks great. Kids like to play rough, even girls can go a little nuts. Windsor know this and as a result they have put in a very thick frame. The frame is 28 mm x 28 mm so it is very robust and makes the whole structure one that is very strong, sturdy and in it for the long haul. 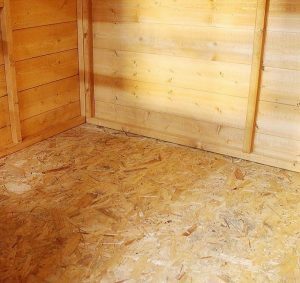 The flooring inside the playhouse is the same kind of solid sheet boarding that is used for the roof. It is a little thicker at 10 mm, so it is going to be able to take a lot of jumping around and anything else they get up to inside of here. The decking on the outside is a bit different. It almost has a tongue and groove type look to it and is a bit thicker than the flooring on the inside. 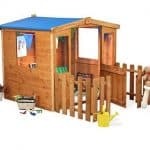 The 13 X 12 Windsor Rose Tower Activity Centre Playhouse will come to you with a basic dip treatment, so you are going to have to roll up those sleeves and give it a generous coating of wood treatment. Or if you want, get the kids to do it. Only joking that would be a nightmare and would end up with treatment most likely everywhere but the playhouse. Being serious, treating the playhouse is not a hard or time consuming job and a fresh coat just once a year is all that is needed to keep it free from rot. We really like this playhouse, but we must admit that it is a little bit disappointing they are only giving a one year guarantee with it. 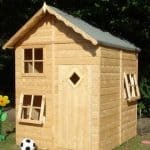 This is well made so we do not see many people having any issues, but we have seen many other wooden playhouses come with as much as a five year warranty. They have used a single door, but at 1 foot 11 inches wide and 3 feet 3 inches high the door is a decent enough size where the kids will not have trouble getting in. A magnetic catch is used so they will be able to open it easily, but then when the door is closed it will not just blow open in the wind. The door is also a major part of the charm of the playhouse as it has this lovely design on it as well as decorative hinges. There are three fixed windows on the playhouse with one on the front and then one on each of the sides. We really like this as it lets in light from a variety of angles. Plus these windows have a very smart looking cross frame which adds to the personality of the playhouse. We would have liked it if one of these was an opening window, but as they are they are still good. They are made from styrene so do not worry about a ball hitting one of them and then there being broken glass everywhere. Talking about the security of a playhouse is a little bit weird. But we can tell you that this one here offers just as much security as the rest of the playhouses we have seen. The magnetic catch is the key here as it will prevent the door from just swinging open when it is a little bit windy. With there being three windows on the playhouse, your kids will not have much privacy. But this is something that can easily be fixed with some curtains or blinds. 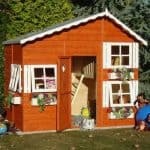 The 13 X 12 Windsor Rose Tower Activity Centre Playhouse does not have any customisation options, but really there is no need for any in our opinion. This is all about having fun so messing the design is not necessary at all. If you do want to put your own stamp on it. Then you can do this via the wood treatment. Before you go out and buy that classic brown wood treatment have a think about a red, blue or some other colour of wood treatment. Windsor are not offering any extras with this playhouse, which is a good thing as you are not tempted to go and spend even more money! This is a very well made playhouse. Tongue and groove walls and that frame make it one very impressive structure. We feel that they have gone with the best materials they could at this price point. This is going to last for many years and most likely your kids will get too big for it before it shows any major signs of wear and tear. While the actual playhouse is not the largest we have ever seen, as an actual structure this thing is huge. So make sure you measure your garden properly before you purchase it. With this being so big and having so many parts, you are going to need a friend and a day off to put this together. While it may take a while, it is not so hard that you will throw down the screwdriver and curse the person who invented DIY. This is not one of the cheaper playhouses on the market, but you are getting far more than a playhouse. You get the ladder, the decking and of course the swing as well. So really, we feel the price is actually quite fair. 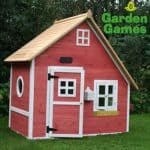 Final Thoughts: The 13 X 12 Windsor Rose Tower Activity Centre Playhouse is the kind of thing that all kids dream about having in their garden. The playhouse is great and they will be able to have a lot of fun in there and on the decking area as well. But when you add in the ladder, swing and slide then they can have hours and hours of fun with this set. There is so much to do that you can have a whole gang of kids playing on here and none of them will be bored. With all the great features and good looks it is easy to overlook just how well made this is, and the materials used and the design is something that really did impress us. This is a great set and perfect if you want an all in one entertainment centre for the garden.